A Long Time Dead is now available in paperback and eBook! 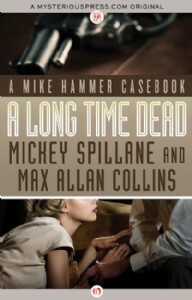 This collection of Mike Hammer stories, started by Mickey Spillane and finished by Max Allan Collins, was called a collection of "gems" by Booklist. It starts with a few near-accidents. A car almost swipes Mike Hammer when he’s crossing the street. A junkie robs the notoriously hardboiled detective at knifepoint. A fight on a subway platform comes close to pushing him in front of a train. While any one of these could be a coincidence, together they make a conspiracy—one that Hammer will have to end in order to survive. And when it comes to finishing something—or someone—nobody does it better than Hammer. One of the twentieth century’s bestselling American mystery authors, Mickey Spillane changed noir fiction forever when he loosed Mike Hammer on the world. Now these eight short stories, collected and finished by Max Allan Collins, show that Spillane is still capable of redefining the genre. The stories in A Long Time Dead have received numerous accolades, including an Edgar Award nomination, two International Association of Media and Tie-in Writers “Scribe” Awards, and a Private Eye Writers of America’s Shamus award.